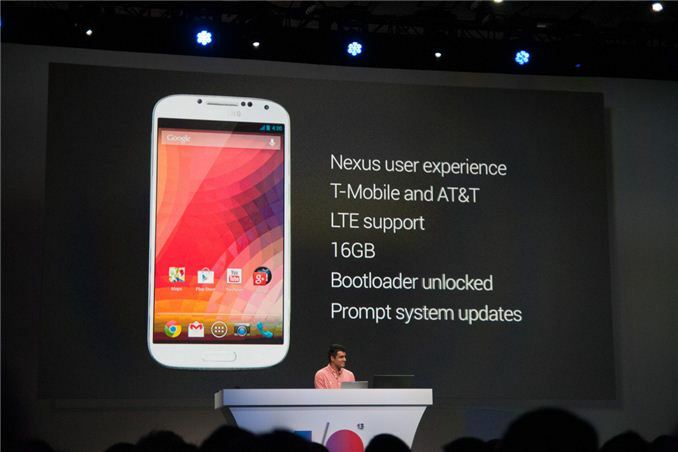 Just two days ago, Google announced a variant of the Galaxy S 4 packing the "Nexus user experience." Although not an I/O giveaway, Google chose I/O to announce the new variant. I've spent a lot of time at I/O tracking down what information I could about this SGS4 with Nexus experience device, but there's not a whole lot to be known beyond what was announced in the one title slide and blog post. At a high level the details are known — it's an SGS4 with 16 GB of internal storage, unlocked modem and bootloader, with support for T-Mobile and AT&T LTE and WCDMA band support. The price is what you'd pay for any other SGS4 unlocked without a subsidy, $649 through Google Play starting June 26. First, the SGS4 with Nexus Experience doesn't really have an official name yet. 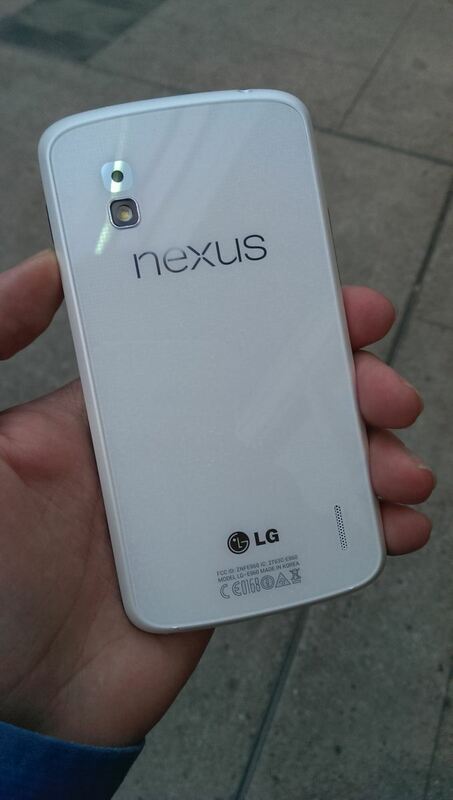 At present it's just being called an SGS4, and doesn't appear to be getting tagged with the Nexus brand. 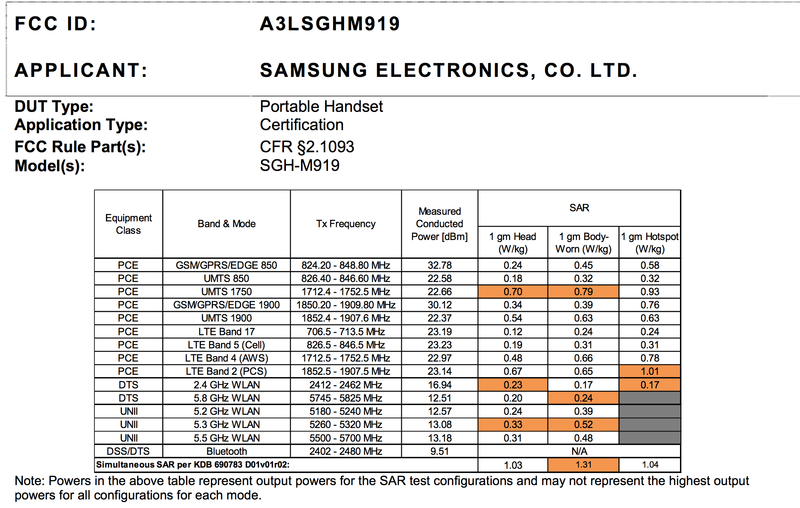 Next, by process of FCC ID elimination and lots of asking around, I am now fairly certain that the rumors about this being the T-Mobile USA SGS4 hardware variant, specifically SGH-M919, are true. SGH-M919 has always included support for LTE on Bands 2, 4, 5, and 17 (that's 1900 PCS, 1700/2100 AWS, 850 Cellular, and 700 Lower B and C) and WCDMA on Bands 2, 4, and 5. At another level, this is the same hardware as the AT&T variant but without the arbitrary RAT (Radio Access Technology) locking that AT&T has put in place to restrict use of Band 4 WCDMA which T-Mobile needs for a good experience. This translates to that support for AT&T and T-Mobile LTE and WCDMA. That also means Snapdragon 600 (APQ8064AB) and no Exynos 5. Lastly, I'm fairly certain that Google is using the "Nexus user experience" in place of the previous "Google experience device" branding which it used previously. This does however mean updates are indeed delivered by Google and not some other entity. Matias Duarte referred to this work with Samsung to bring an SGS4 with Nexus experience directly during the later Android fireside chat. We'll have a review of the SGS4 with Nexus experience in due time as well. For enthusiasts who like the SGS4 and don't want the TouchWiz software bloat, this might be the device to get, if they haven't gotten one of the skinned, carrier-approved bundles already. The only other interesting device related news is tangential and unrelated. I had a chance to hold Taylor Wimberly's (of Android and Me) White Nexus 4 which he picked up from an unnamed source at I/O. 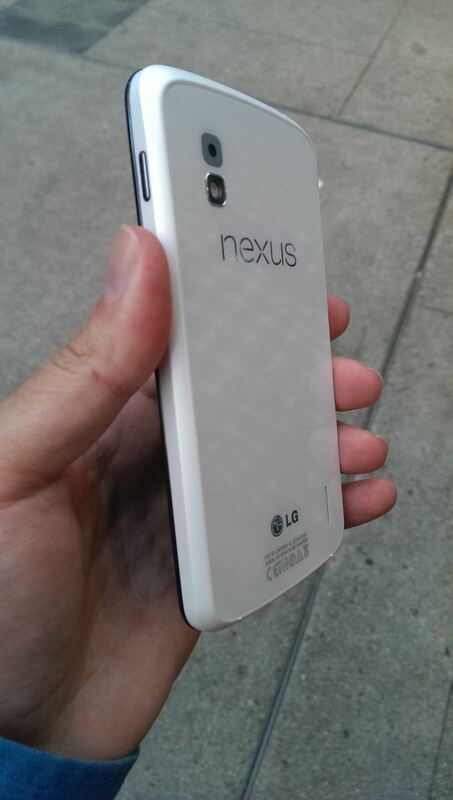 The white Nexus 4 looks stunning in person, it's stark white on the back and has a slightly cream colored tinge on the lip. There's still the laser etched pattern behind the glass as well, but obviously white. The front of that Nexus 4 remains black however. There's a chrome lip around the camera aperture as well instead of the black ring. Hardware inside remains unchanged of course, there's none of that LTE goodness we hoped might get enabled, but it's still a striking aesthetic change. I'm assuming the white Nexus 4 is the same Nexus 4 we've seen before (I know you didn't get a chance to check any details about it, so I know you don't know). The most disappointing thing from I/O for me was the lack of any details about Android 4.3. I am glad to hear from the one fireside chat that they plan to continue working on getting rid of jank in the UI. Supposedly the white Nexus 4 is the same thing as the black Nexus 4 internally, same SoC and cellular band support (no official LTE, etc). Cinnabuns, it's Google Distortion field. They ignore all of the bugs in the current version because new shiny things are dangled in front of them. They do the same thing with Google Earth; 7.0 Did not fix many of the issues in 6.2, introduced new ones, AND they made horrid changes to the UX that no one is happy about. Yet Google basically said 'meh' because the feature makes it look flashier, even if it's less useful for the paying users who need it the old way for production. As for your bluetooth, I feel your pain. have you tried any of the custom kernels out there? I was having all sorts of stupid Bluetooth issues with my Nexus 7 until I switched to a Motley kernel. Before It would take 5-10 times to connect to certain devices. Now I'd say ~95+ percent of the time it connects on the first go.